You can use the dip bar with different body sizes and weights. They hold up well if you tighten the screws, you can practice dips, leg raises,push up, pull up, stretch or other body strength training or cardio with them. 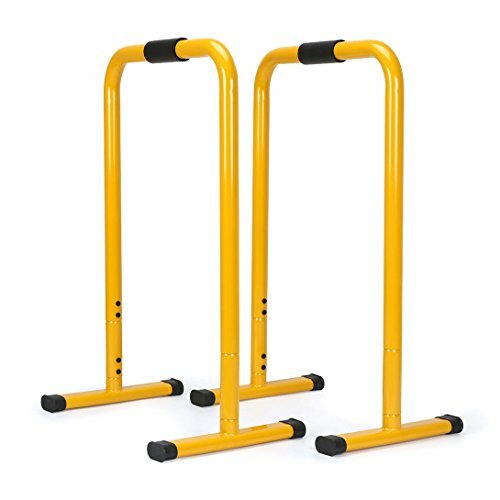 You will get 2 bars, they are easy to put together, and they are not connected, you can move them as close or as far as you like. Weighs 19 lbs, they are lightweight but support up to 300 lbs, Size: approx. 22 inches in length, 15 inches in width, 30 inches in height. This high-quality functional fitness dip stand station with stabilizing challenger bars is perfect for full body bodyweight resistance exercises such as dips, push and pull ups, L-sits, knee and leg raises, stretches and more. Simple, portable, yet multi-purpose and versatile piece of strength training equipment that works arms, chest, back and core muscles like no other can, using your own body weight as resistance. If you have any questions about this product by AHHC INC, contact us by completing and submitting the form below. If you are looking for a specif part number, please include it with your message.